Notes on the Synthesis of Film, Art… Life? Recently I’ve just finished reading Paul Schrader’s Transcendental Style in Film: Ozu, Bresson, Dreyer (1972). Yes, that’s before Schrader rose to prominence as a screenwriter and filmmaker. Is such a book a bit dated? Considering the techno-reigning world we’re living in now, where speed is measured by nanoseconds, and where 3D and CGI have become the necessary features for movies to generate sales, I think we need to read this all the more. The three directors in the book had produced some of the best movies of all time. Since I have not seen all the films Schrader discusses, I might not have grasped as fully his arguments and illustrations as they deserve. And I admit I do not embrace unquestionably all those that I do get. Nevertheless, there are many, many parts that I want to record down. I’d consider them crucial elements to mull over during the creative process in just about anything. I’ve listed some of these fine quotes in the following. They all point to the axiom of ‘less is more’, the value of stillness and simplicity, the speechless sketch that speaks volumes, the importance of being over doing, the quality of sparseness over abundance, the bare essence of life. Notes to myself: when watching, writing, reading, doing, or just plain walking down the mundane path of everyday, keep these points in mind. In films of transcendental style, irony is the temporary solution to living in a schizoid world. The principal characters take an attitude of detached awareness, find humor in the bad as well as the good, passing judgment on nothing. 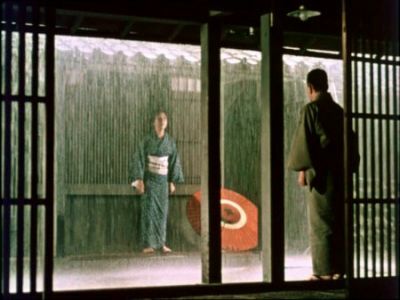 On the surface there would seem little to link Ozu and Bresson… But their common desire to express the Transcendent on film made that link crucial… Transcendental style can express the endemic metaphors of each culture: it is like the mountain which is a mountain, doesn’t seem to be a mountain, then is a mountain again. The transcendental style in films is unified with the transcendental style in any art, mosaics, painting, flower-arranging, tea ceremony, liturgy. At this point the function of religious art is complete; it may now fade back into experience. The wind blows where it will; it doesn’t matter once all is grace. Transcendental Style In Film: Ozu, Bresson, Dreyer, published by University of California Press, 1972. 194 pages. Schrader quoting Donald Richie, “The Later Films of Yasujiro Ozu,” Film Quarterly, 13 (Fall 1959), p. 21. The following three quotes are from the same source. Oh yes, the transcendental. This is very good, and it does sync with my post and my thoughts at the moment. I slipped by your comment after reading it with interest, so sorry. But I have come back, seen it again, and responded. There I mentioned that I love the film Lost in Translation for this restraint written of here. When we moved home from Istanbul, and Don had NFL Monday Nite Football on the TV, I sat, astonished, at the glitter and techno-mayhem just for the opening montage. I wondered how much money was spent on it. Stuff like that actually drives me away. It’s interesting that you mentioned Lost In Translation because that’s another example of exploring the existential while adhering to another style. Sofia Coppola is no Ozu, but her handling of the movie just makes one think of deeper issues and meaning. Although it’s not a ‘quiet’ film, it stimulates quiet thoughts. And in the midst of all the techno frenzies nowadays, it’s all the more important to hear that ‘still, small voice’ speaking to us. Thanks for sharing your thought and let’s just enjoy the synchronicity. BTW, Paul Schrader himself after writing this book had moved on to write a few screenplays that had also left marks of being some of the best movies ever made. And I remember your Cartier-Bresson post, while this is Robert Bresson the film director here. 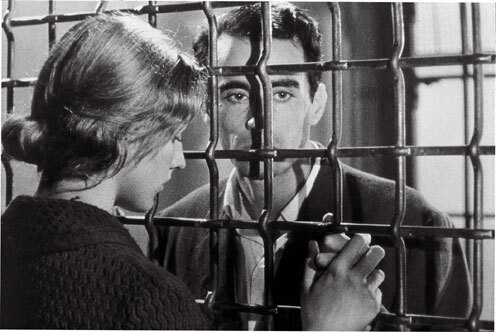 The b/w picture on my post here is from his film Pickpocket. If you haven’t seen it, you’ll enjoy it as I also remember that you like Kieslowski’s Trois Couleurs. I’m having a terrible time focusing on this post, as my attention is being consumed by a recent and rather sad synchronicity. I’ve been in Louisiana in the swamp and bayous, and since returning have been caught in watching the terrible oil spill move toward places where I quite literally stood as the Deep Horizon sank to the depths. It was a light and fun trip and I’m still trying to find a way to write about it all in the new context. However. I posted some photos on the Weather Underground site, where most of the story unfolded, and caught the attention of another photographer. He, in turn, posted some images from the same area which he took a few years ago. I’m not sure why this seems relevant – except that once again we have richness and depth exposed by a slow, detailed, labor intensive process calibrated not by a machine but by human decision and hand. What he produced is “photography in repose” – not the frenetic clickclickclick of the digital world, but the gentle coaxing of rich, spare images from film. I’ll bring back the link to one of his images in a bit so you can see it. The oil spill is certainly a devastating catastrophe… you know, I was thinking about you and wondering whether it had affected your boat varnishing business. The sync here is obvious as I remember your recent post about photography. The older method, especially when the photographer develops his/her own pictures, is an art in itself. The techno progress we’re having might have made everyone a ‘photographer’ with a click, but not ‘an artist’ with skills and insight. I suppose that’s the difference between a ‘snap shot’ and ‘photography’ with depth and significance. And, I suppose that’s the distinction between ‘movies’ and ‘films’. But as Ruth has mentioned, about the movie Lost In Translation, there can be different artistic styles in expressing meaning and deeper thoughts. But I’m convinced that stillness and solitude are essential for one to grasp and appreciate them. Here you go. Scroll down past a couple of weather maps and you’ll find some iris. Wow… those photos of the comet are marvellous. The irises are exquisite! I really should get a better camera… right now I’m just using a pocket digital, that’s why the deer photos are far from satisfactory.